The PUPPS rash has nothing to do with your dog, but refers to a very itchy rash during pregnancy. That’s right, this PUPPS rash refers to Pruritic Urticarial Papules And Plaques Of Pregnancy. No one really knows what causes the PUPPS rash and it usually begins in and around pregnancy stretch market. Researchers feel that the sudden rapid expansion of skin layers and connective tissues in the abdominal region could be the reason for the skin irritation. Other studies have shown that baby DNA could be the reason for the irritation. The baby’s DNA has been isolated from the mother’s abdominal tissue. The DNA may act as a skin irritant and give rise to the Pupps Rash. In the UK, new coins with higher amounts of the metal nickel have been released in the beginning of 2013 and this creates concerns that those prone to eczema may have an allergic skin reaction. Although there are specific amounts regulated for the amount of nickel contained for certain categories of items that touch the skin such as jewelry (necklaces and earrings) and watch bands, this isn’t the case for coins. According to statistics, more than 15% of people are allergic to different types of animals. Eleven million people are supposed to be allergic to cats alone and the number is almost double for dogs. Yet, animals are wonderful companions and we create deep, emotional bonds with them. The proteins that are found in the skin, hair and saliva of pets can irritate the human body. The human body may consider these proteins as dangerous bodies and start to attack them in an effort to removethem from direct contact. The exact type of body reaction or allergic reaction will vary considerably. Some patients experience hay fever, skin rashes, general itchiness, breathing difficulties or even asthmatic symptoms that may get worse over time. All these reactions are an effort by the body to push the foreign proteins away and to warn the brain that the proteins are dangerous. This is particularly true in children. Does that mean you need to avoid keeping any type of animal at home? You’ve got lovely light skin and you take the best care of it with the latest moisturizers, toners, sun blocks, and skin care products. But, even after so much care and protection, your skin still seems to have issues. There are wrinkles, dark patches and other irregularities. Is there any particular reason for this? Skin piercings are a very popular fad and both body jewelry as well as tattoos are common. As a result, thousands of tattoo parlors and body piercing centers have emerged. Before you rush out to get your body pierced and poked, it is good to do your research. Price is not necessarily the best way to judge services and not all tattoo parlors and body piercing centers follow strict medical standards. As a result, there can be skin complications after these procedures are performed. Let’s just take a look at why and how this can happen. On May 17th 2012, twelve students and two teachers who were studying in one room suddenly came down with a red rash on their arms, legs and body at 9.30 in the morning. The unusual problem created a tizzy and school authorities were quick to call in the regional hazmat response team to evaluate the condition. The school was closed down and 80 unaffected students were shifted to another building for evaluation. The affected students were separated by gender and transported by bus to the Memorial Regional Hospital. We’ve had some hot days this spring and many people are ready to fill up the hot tub and have a nice soak. Be warned though, there is a chance that your hot tub could be hosting an unseen danger which can result in skin irritation or a rash. Also, it may not erupt immediately so you can easily think it was due to another cause. Last week one of my clients came in and told me that a rash that she thought was due to an allergic rash to wheat products was actually a hot tub reaction. You are frustrated by an annoying irritating rash that just does not seem to go away. 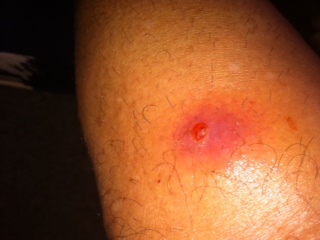 It’s red and may increase in size or redden when your work out and continues to itch all through the day. Initially, you thought that the rash might have been caused due to new clothes or exercise friction but now you’re starting to get worried. Could this be the sign of something dangerous? Could the rash and exercising be related? There are many unavoidable things parents of a newborn are going to encounter. And one of the most unnerving ones is diaper rash. Yes, no matter how well you clean your baby and prepared you think you are, diaper rash often creeps its way into the picture. Fortunately there are a number of ways to combat it and keep it from getting worse. There are also issues for seniors that live in nursing homes or at assisted living facilities. The rash appears like other skin reactions but is distinguished by a couple features that are exclusive to HIV infection. It is important to seek the advice of a healthcare provider for any skin irritation that does not go away within a few days or becomes worse with time. This is important both for diagnosis as well as treatment. There can be a great deal of anxiety over rashes since the mind circles over each possibility. Seasonal hay fever and symptoms of sneezing, runny nose, watery or itching eyes, and congestion can also be accompanies by other physical symptoms. Can spring allergies cause rashes? The answer is yes. Occasionally people will be sensitive enough to break out when they come in contact with various pollens, molds, or other organisms. The hives or small bumps are almost always accompanied by other signs though they can occur by themselves.